We have been craving for pizza and decided to go out for our date night. I had read about 400 Gradi in CNN Travel. They were featured after they won the Campionato Mondiale Della Pizza (Pizza World Championship) in Italy in 2014. 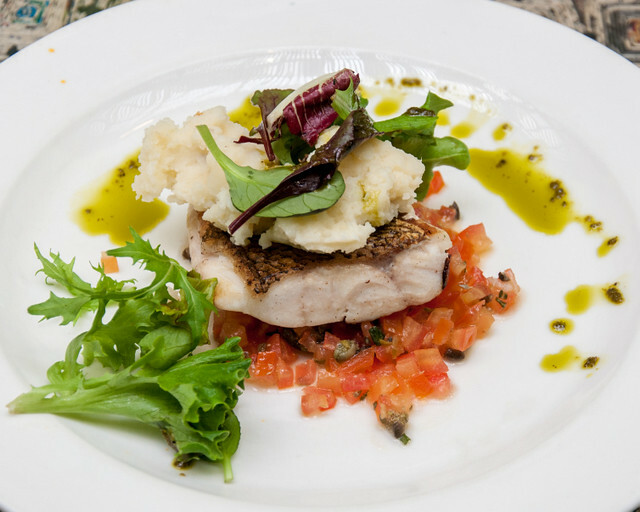 The owner and Chef Johnny Di Francesco won the top Margherita title. He beat some of the world best pizza chefs so our expectations were quite high. We made our reservation online and the place was packed when we got there at eight o’clock. I loved the modern décor with the polished concrete surfaces. The only problem was the accoustics of the main dining area. The sound bounced around so much that it was noisy compared to the bar area in the adjacent room. We ordered the Margherita Verace Pizza, Spaghettini al Grancho and Tiramisu to share. 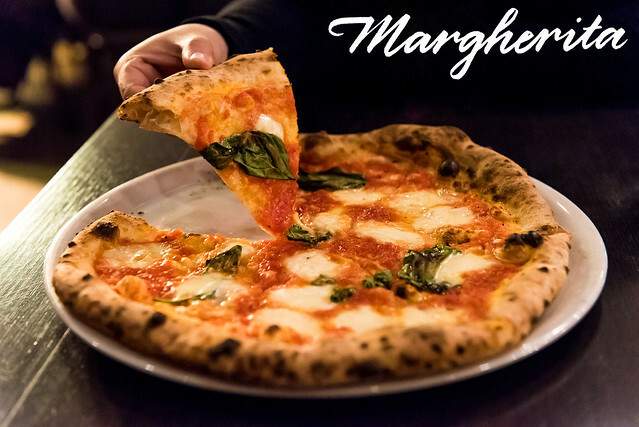 The Margherita Verace Pizza was made with Sam Marzano tomatoes, Buffalo mozzarella and basil. It was a delicate sauce but it was flavourful and delicious. We both loved how fresh and light this pizza was. 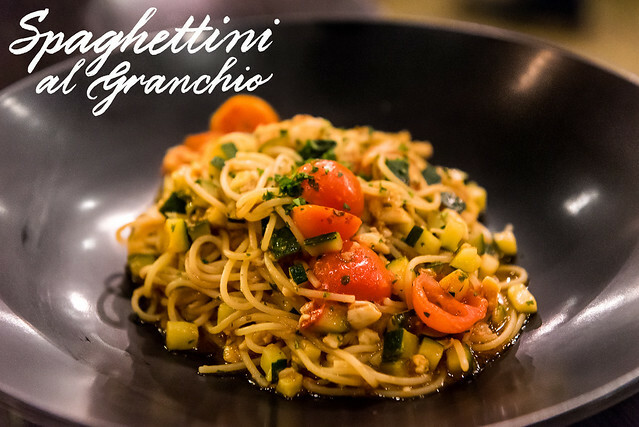 The Spaghettini al Grancho was made with Spanner crab meat, chilli zuchinni, cherry tomatoes, white wine and lobster bisque. The dish is served with some chilli and parmesan cheese on the side. I wish there were larger chunks of crab meat in this dish. I would recommend adding a little chilli for a little kick and as crazed cheese lovers, we couldn’t help but add a lot of parmesan cheese. We would order this dish again for sure. 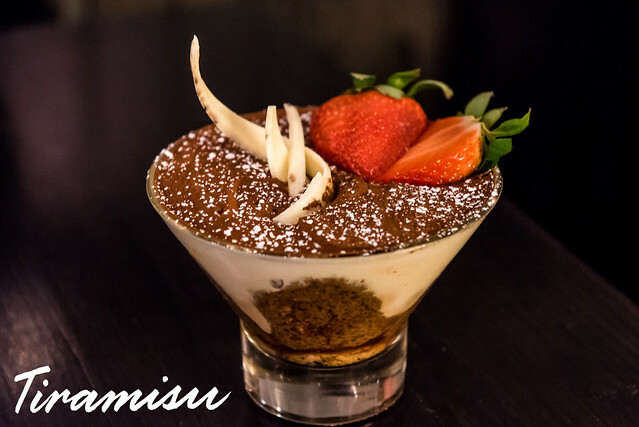 The Tiramisu was made with mascarpone cream, savoiardi biscuits soaked in coffee and marsala wine. It was a delicious dessert but I would have preferred it if it was served in a different container. It was difficult to get all the layers with one spoonful. The service was quick even though 400 Gradi was packed and our server was friendly. The food was great and we will definitely come back again. 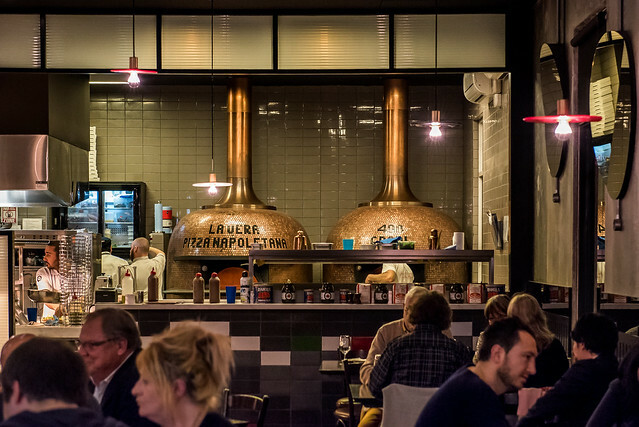 This entry was posted in Food Review and tagged 400 Gradi, Australia, blog, Brunswick, Food, Melbourne, pizza, restaurant, restaurant review, review on August 18, 2015 by Katrina Alana. Lucha Loco is a taqueria which has a lovely garden bar that serves Mexican food. We’ve passed by the restaurant several times whenever we go around the neighborhood and we finally decided to try their food a few weeks ago. The hostess promptly greeted us at the door and seated us. Seating was limited to two hours as the restaurant was full and we didn’t have any reservations. I didn’t mind having limited seats since we didn’t have reservations, but it seemed like they were limiting all their customer’s stay at the restaurant that night. The service was excellent and our food didn’t take too long to arrive in between dishes. 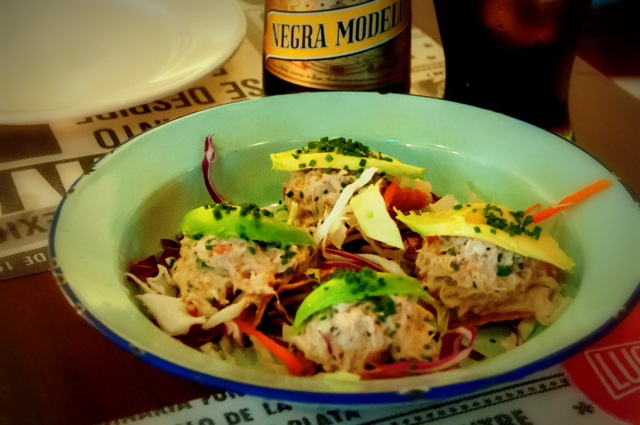 The Tostaditas de Cangrejo or crab tostaditas arrived first and although the menu says that it serves four, I think that it only serves 2. There are four pieces but I don’t think that one piece is enough per person. The appetizer was light, refreshing and delicious. 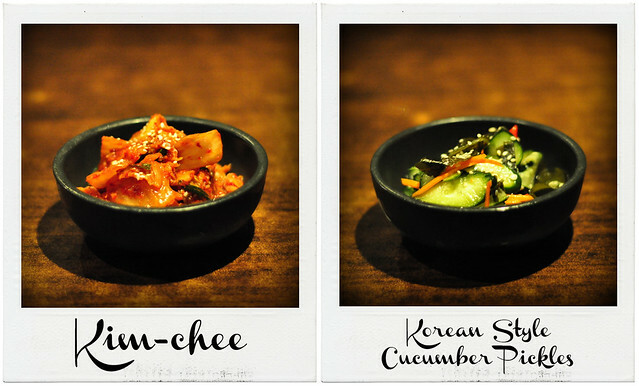 I was surprised at how I liked the dish that I was anticipating our other orders. The Taco de Carnitas or pork belly taco was just as scrumptious. The porky porky goodness went well with the avocado and scallion. The meat was tender and the dish was savory without being too heavy. The Quesadillas de Conchinillo or pork quesadilla was delicious but it was not really that memorable. I liked how the dish came together but I was not as amazed as I was with the other dishes but I would still order it again. 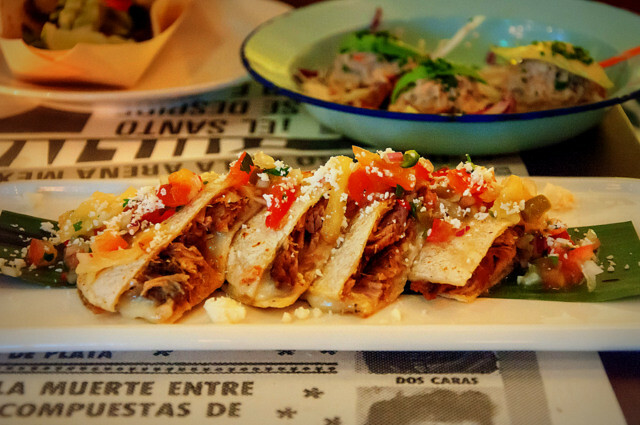 Lucha Loco has great food, ambiance, and, more importantly, they have great service. Having an early dinner may have been a factor to the quality of their service but we would definitely love to come back at another time with our friends. This restaurant is a must try! 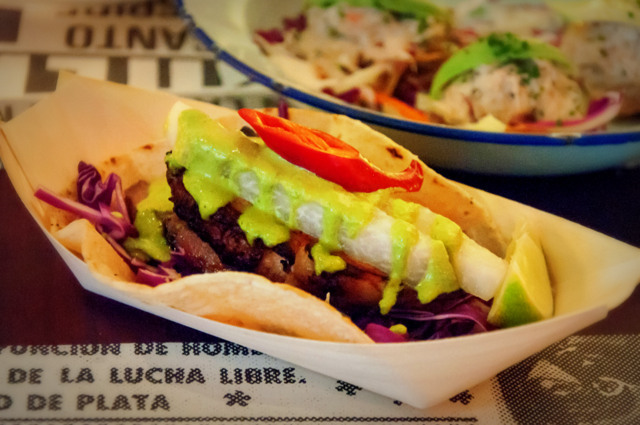 This entry was posted in Food and tagged cuisine, Duxton, Food, Lucha Loco, Mexican, Mexican Food, restaurant, review, singapore on February 11, 2014 by Katrina Alana. 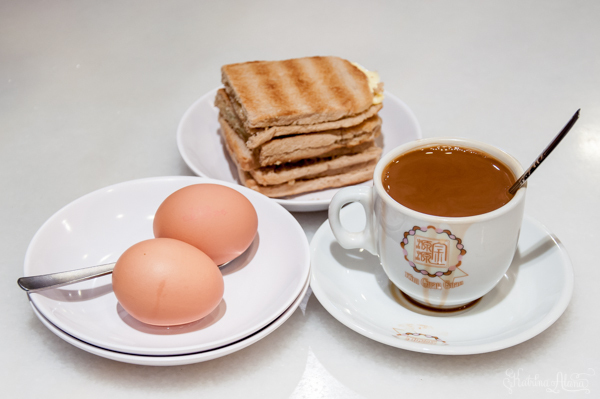 I love coffee and but I was never a huge fan of toast until I tried the kopi, kaya toast and runny eggs combo here in Singapore. 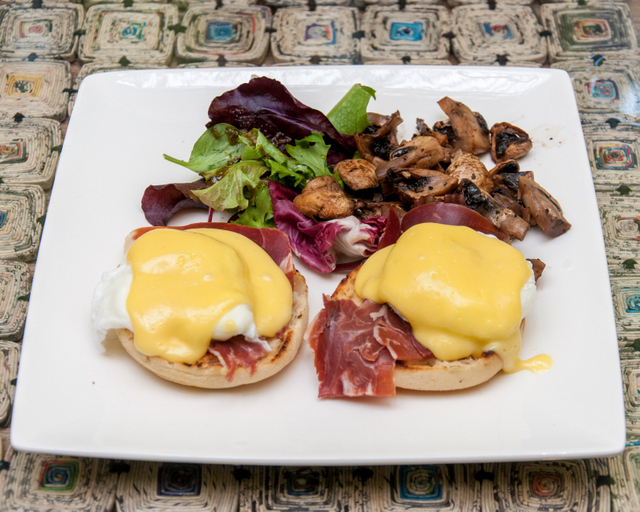 It is the quintessential breakfast and a must-try. 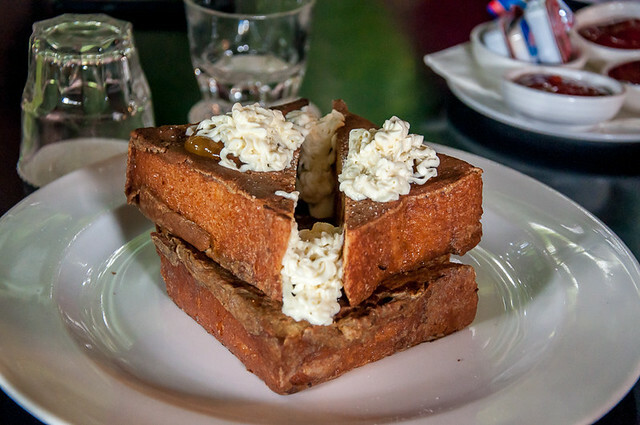 A good kaya toast breakfast must have a delicious kaya jam with a good balance of kaya to margarine / butter ratio, well toasted bread, perfectly brewed coffee and a pleasant place to eat to enjoy your meal. 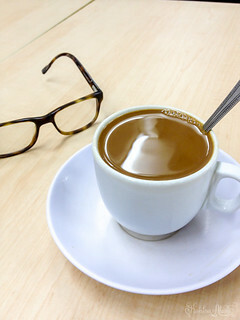 Now we make it a point to try the various coffee places in Singapore during the weekends and we’re sharing our reviews on what we think about the popular kopi places in town. 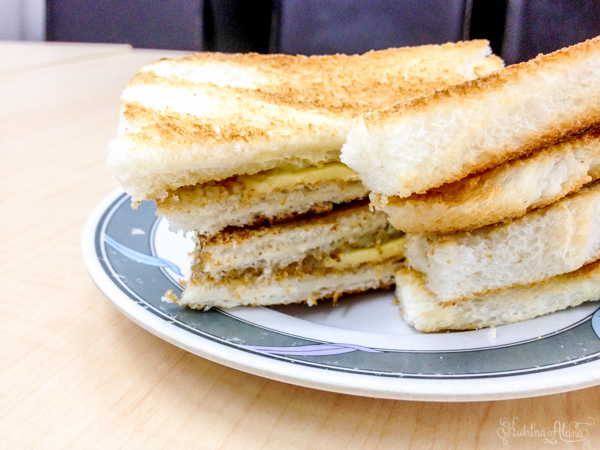 I’ve wanted to try the kaya toast at Tong Ah Coffee Shop since it was featured in a Makansutra article in Yahoo. This place is supposed to be popular with international chefs, so we had pretty high expectations when we went there and sad to say we were deeply disappointed. The kaya toast was delicious and I loved the white bread that they used but the coffee was just so-so, the eggs were almost hard boiled and the uncle manning the shop was constantly shouting angrily at this staff. Constantly. Noisily. Shouting. The place is out of the way and the food standard is not even at par with the hawker place near my building. 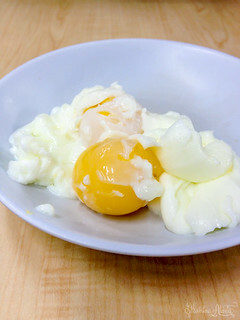 The uncle even went to our table and observed us trying to mash up the almost hard boiled egg when he served our coffee and left without a comment. When we tried to check out the other tables, the eggs that were served were also the same as ours. Tsktsk. Good Morning Nanyang Cafe has a branch near our place and we went there last weekend. The cosy ambiance and made it pleasant to hang out there. It is a place where you can chill with friends on a lazy afternoon. The kaya toast was delicious, the eggs were runny and the coffee was well brewed. We’re looking forward to going back there to try the other versions of kaya toast that they offer since we only tried the traditional one. Ya Kun is everywhere. When we started going around looking for the best kaya toast, I didn’t expect such a commercialized coffee place to be my favorite so far. We desperately wanted to vote for the little hole-in-the-wall places and patronize small businesses over such a large chain but the food speaks for itself. I’ve never been dissapointed when we go to have coffee at Ya Kun. 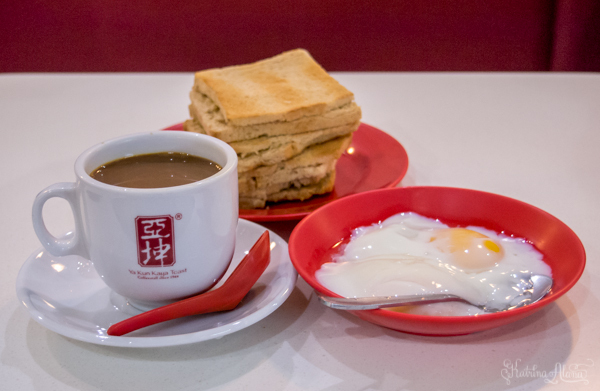 The kaya toast is delicious, the eggs are runny and the coffee is great. The only things that the place lacks character. Do you have any other places to suggest? Leave a comment below and we will try out your recommendation when we’re in the area. This entry was posted in Food, Reviews and tagged chinatown, Coffee, Good Morning Nanyang Cafe, guide, insider, kaya, kaya toast, kopi, local, Makansutra, recommendation, restaurant, review, singapore, Singapore breakfast, Tong Ah, Tong Ah Coffee House, Ya Kun, Yahoo on October 28, 2013 by Katrina Alana. Our friend Suzi from Tiramisuzi recommended the Pulled Pork sandwich at Two Blur Guys near Tanjong Pagar MRT and we finally went there a few weeks ago. Lex ordered the Pulled Pork sandwich which was delicious but the Prime Beef with Streaky Bacon really stole the spotlight. The gruyere chese complemented the perfectly cooked and juicy beef patty. The sides were great specially the potato salad. We will definitely come back to this place to try the other burgers on the menu. 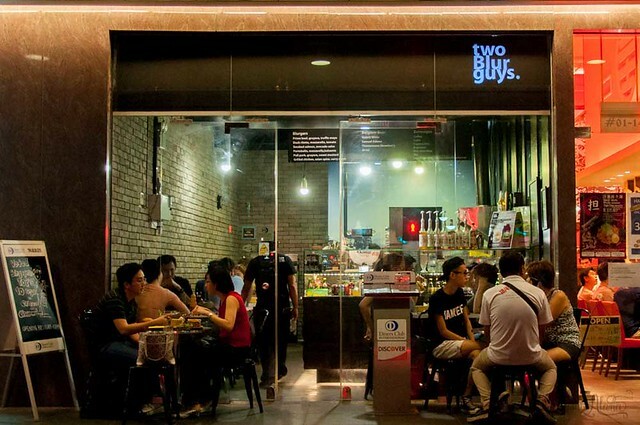 This entry was posted in Food, Reviews and tagged burger, burgers, restaurant, restaurant review, review, singapore, Tanjong Pagar, Two Blur Guys on September 12, 2013 by Katrina Alana. Our group of friends hosted a baby shower for our buddies Shanta and Kyle last weekend at the Canopy Garden Dining and Bar. 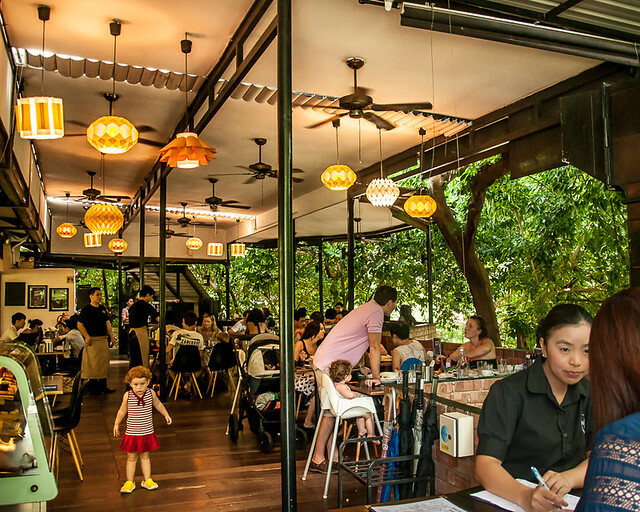 We chose this place since it very good review online and it was hailed as one of the best places to have brunch in Singapore. Antonette was in charge of the guest list and the party was an intimate celebration with close friends. 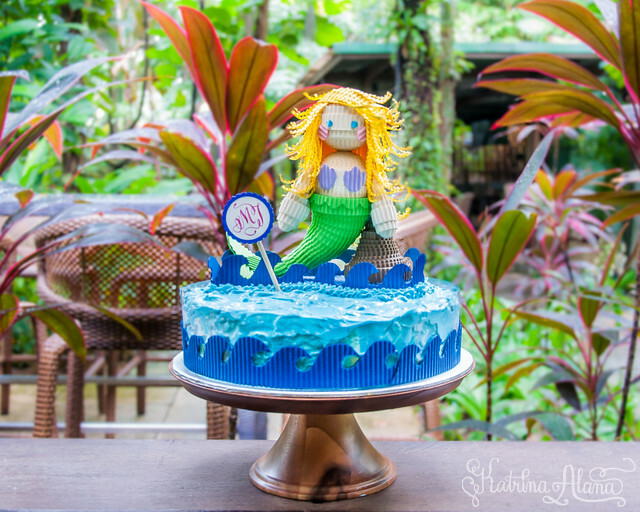 We made a mermaid cake topper since Shanta was planning on decorating the nursery in a mermaid theme for their baby girl and we had some fun and games courtesy of Kim and Maimai. We were seated at the Green Room and the place great for a small celebration. We had the pan seared snapper and the eggs le grand. The fish was ok. It was cooked well but it couldn’t compare to how delicious the eggs benedict were. We will attest that the hollaindaise sauce they serve with the poached eggs is one of the best in Singapore. We’re are definitely going to come back to this place for brunch sometime soon. 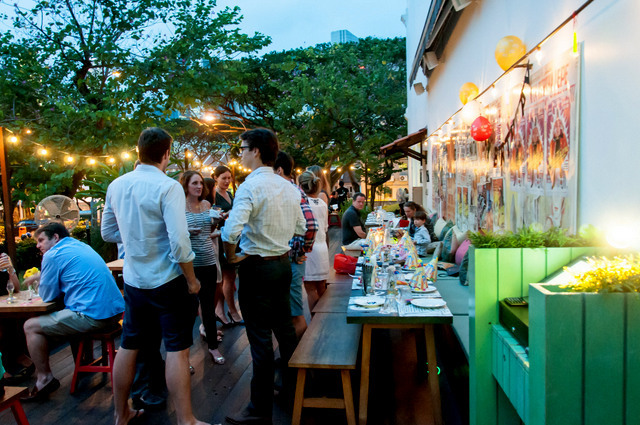 This entry was posted in Food, Reviews and tagged baby shower, Bishan, brunch, cake, cake topper, Eggs Benedict, fish, mermaid, Park, place, restaurant, review, Sanpper, singapore, The Canopy on July 30, 2013 by Katrina Alana. We met up with our friends at The Market Grill months ago but I thought I would still post this review even though it’s so late. Joyce from Chic Noir recommended this place since she knows the chef and it was close to the Red Dot Museum where we were headed after dinner. The place is cosy and the lighting is romantic but the place is also small. The counter and kitchen occupied more than half of the restaurant. A party of six would have a hard time getting a table just like what happened to us. 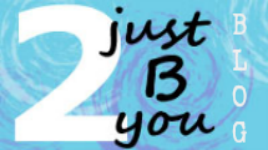 Our party was split into two. If you’re on a date this place would be ideal on a weekday. We had the Wagyu Salad to start. It was ok but I expected it to be more savoury since there was Wagyu meat. My first choice was the blue cheese burger but it was unavailable that night which turned out to be a good thing. I’m very picky when it comes to fish and I rarely eat it but it is so weird that I like fish burgers. 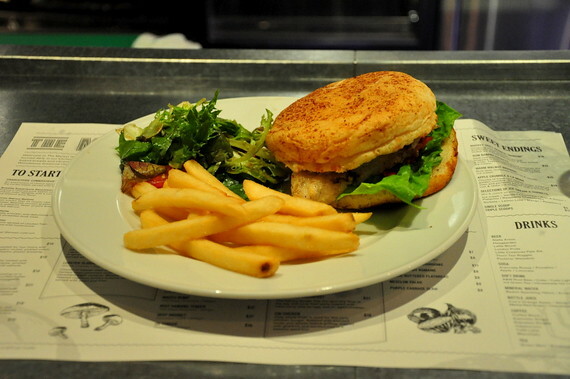 The CW Cod Burger is my all time favorite fish burger in Singapore. The fish was cooked well, parmesan bun was almost like brioche and the herb lemon mayo brought it all together. I would highly recommend the cod burger. Lex had the Burger Breakfast which was suprisingly delicious. 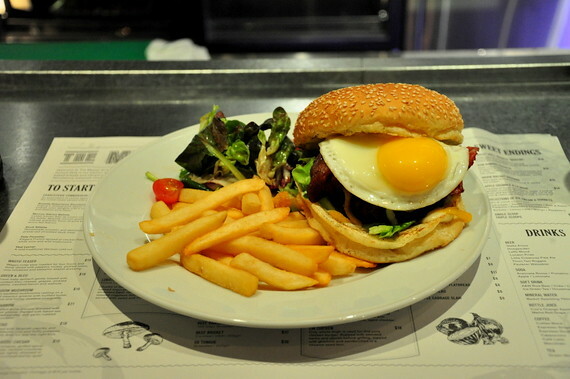 I’m not used to having sunny side ups in burger burger hence the surprise. 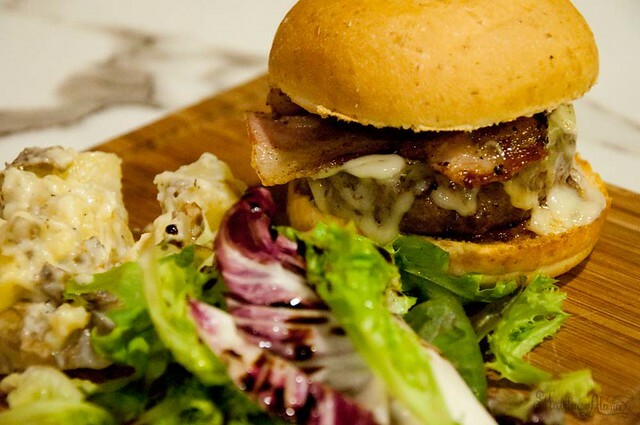 The beef patty was well seasoned and grilled perfectly and the aged chedar and bacon made this burger extra sinful. 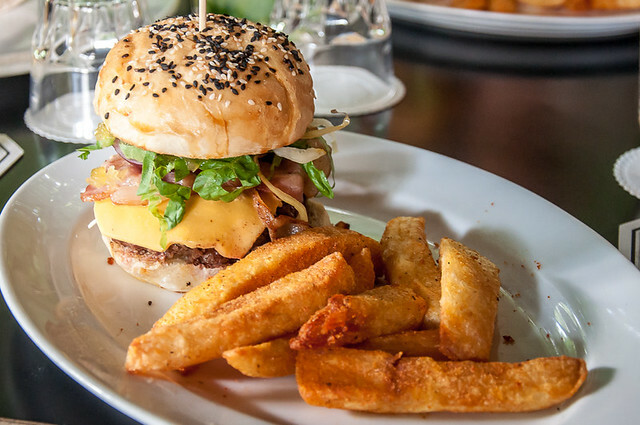 You should get this burger if you’re looking for a heavy meal. For dessert, we had the Rum Banana Pockets. 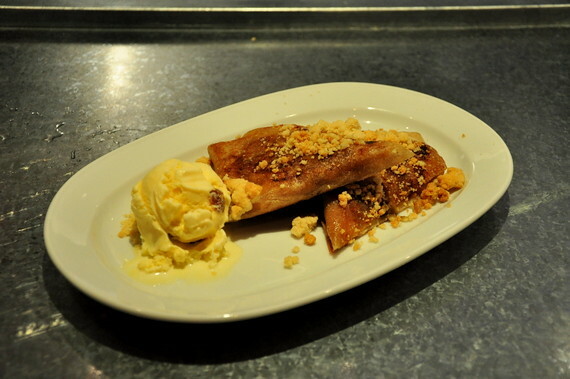 The dark rum was infused into the pastry and caramelized bananas. It was delicious and I’m a big fan of desserts with rum but I didn’t like the brand of rum they used. A sweeter type of rum would have made this dish better. 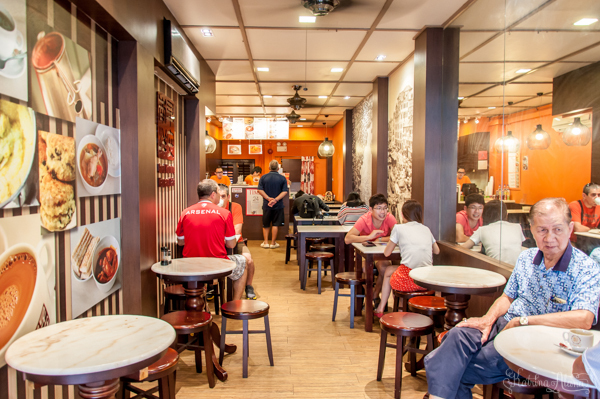 This entry was posted in Food and tagged chinatown, Food, Market Grill, restaurant, review, singapore, The Market Grill on May 19, 2013 by Katrina Alana. We celebrated the baby shower for our friend Antonette, Razid and their baby Luke. We planned to do a nautical themed party with my co-hosts Shanta and Kim. We decided to have the celebration at Spruce which received a good review from one of my favorite food blogs, Lady Iron Chef, as a great place for brunch. We bought a delicious chocolate mousse cake from The Icing Room called Choco Magic since Antonette is fond of chocolate cake. We added vanilla icing from Betty Crocker and we colored it blue to imitate the look of waves. The boat was made of cardboard and sealed with nontoxic sealant so it would be food safe. We put high cake pegs to prop up the cake topper and lined the bottom of the boat with foil. The mast and small sailor which represented baby Luke were assembled on the table when cake was served after we had brunch. Spruce is located at Phoenix Park. I didn’t expect it to be in an industrial looking building on a hill top. I must say that the work “park” in Phoenix Park is a bit misleading. I thought we’d be going to a place like the Botanic Gardens. When we walked up to the entrance I was pleased to see that the restaurant had modern decor and it was set in a lush green environment afterall. 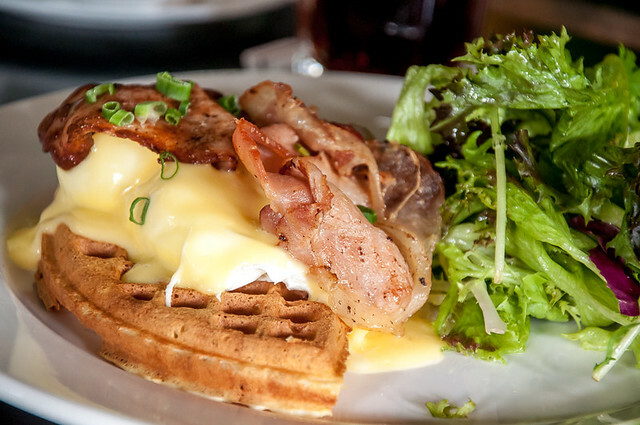 I ordered the Eggs Benny with Corn Waffles and Hollandaise Sauce. The dish was ok but not something I would order again. I guess I’m not a big fan of the sauce. I had some of Lex’s Spruce Signature Burger and it was delicious. I might order this dish when I come back to this restaurant. The Brioche French Toast was a bit too dry for my taste and the presentation is not appealing. I guess I prefer a more traditional preparation of the classic French toast. Some friends ordered the Eggs Benny with Steak and those looked tasty. I would recommend trying the burger over the Eggs Benny with Corn Waffle and the Brioche French Toast. 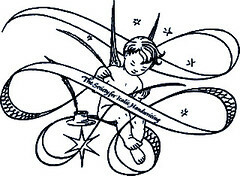 I must say that the service was excellent and the ambiance was relaxing. It would be great if the restaurant’s website was complete since they only have the most basic of information there. I would come back to this restaurant but I would definitely order a different dish. Note: Since we’ve gotten a few enquiries on our cake toppers, we’ve decided to update this post. 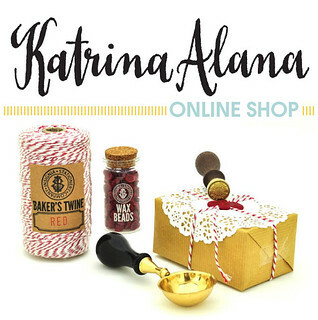 Please contact us via sales@katrinaalana.com for custom cake topper orders. This entry was posted in Food, My Projects and tagged baby shower, Brioche, cake topper, Eggs Benny, Food, French Toast, nautical, restaurant, review, Specialty Burger, Spruce on March 17, 2013 by Katrina Alana. I’m one of those people who complain that flowers cost too much on Valentine’s Day but I do love getting them. 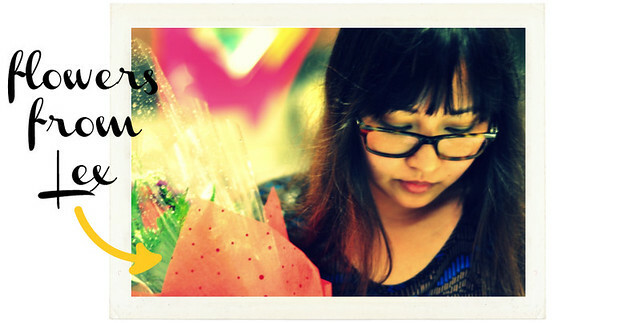 I was surprised when the receptionist handed me a bouquet of red roses from my husband when I came in the office that day. Since we were working on Valentine’s Day, we decided to meet for dinner at Gyu Kaku which is a Japanese restaurant at Chijmes near City Hall MRT. The set we ordered came with assorted meat and vegetables. We got the Warai Set since there were different cuts of meat in the platter that we wanted to try. The restaurant had a nice ambiance and the wait staff was very informative and attentive. They explained the cooking time for each meat and some staff go around checking grills to see if your meat is overcooked and let you know that it’s time to take it off the heat so you can enjoy the meat at it’s finest. 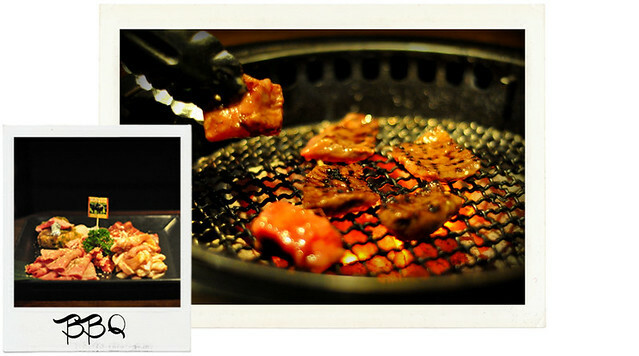 I love yakiniku or Japanese grilled meat. You actually cook you own food in a charcoal grill and the meat has been cut up to bite sized pieces. The thin slices of ox tongue and the wagyu were excellent. I usually prefer cakes for dessert and I was a bit disappointed at the items on offer. I’m not a big fan of Japanese ice cream but the matcha was delicious. We got a free Polaroid photo and the waiters even offered to take shots from our camera without us asking. I highly recommend visiting this restaurant for a special occasion. 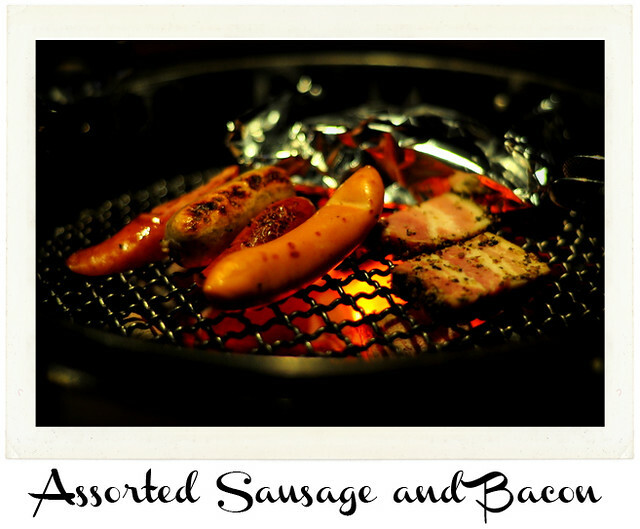 This entry was posted in Food and tagged Chimes, Food, Gyu Kaku, Japanese, Meal, restaurant, review, Set, singapore, Warai on February 25, 2013 by Katrina Alana. 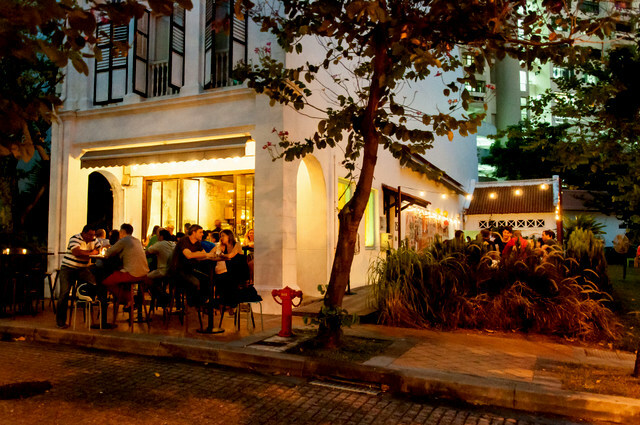 I read about Saveur from various online reviews and I was intrigued by this so-called affordable French restaurant. Saveur opens for dinner service at 6:00 pm and when we got there at around 6:05 pm, the first section of the restaurant was already full, and there was a 30 minute wait to be seated at the second section. We ordered 2 plates of foie gras to share. I know that there is an ethical issue surrounding the main ingredient but I wanted to try it just once. It was fatty, savory and delicious but I wouldn’t order it again also because I don’t like the texture. Apparently my taste is not that sophisticated. I had the Barramundi. I switched plates with the husband who had the Duck Confit. The duck was very crispy and most of the people in our party was raving about the dish. 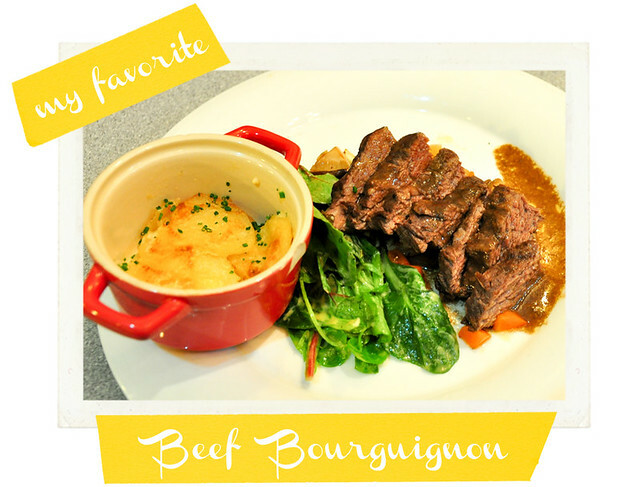 My favorite dish was the Beef Bourguignon. The meat was moist and tender while the au gratin was creamy and perfect. I loved the mustard dressing on the salad. I will definitely have this dish over and over again. The fish was moist but the skin was not crispy. This dish was supposed to have crab as one of the components but we had a hard time looking for the taste of crab. 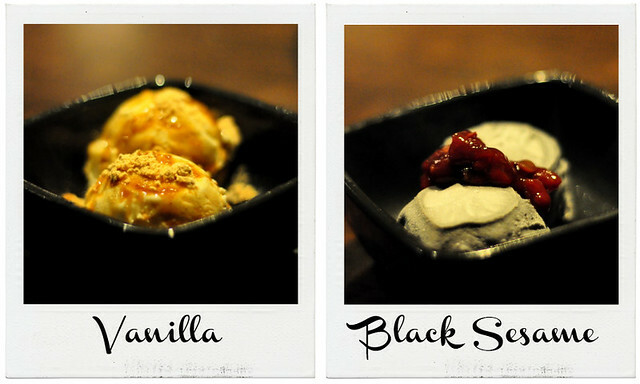 We tried all of the desserts. The Chocolate Hazelnut was ok. It reminded me of Nutella. The Pistachio Panna Cotta was delicious and it was the best dessert they offered. 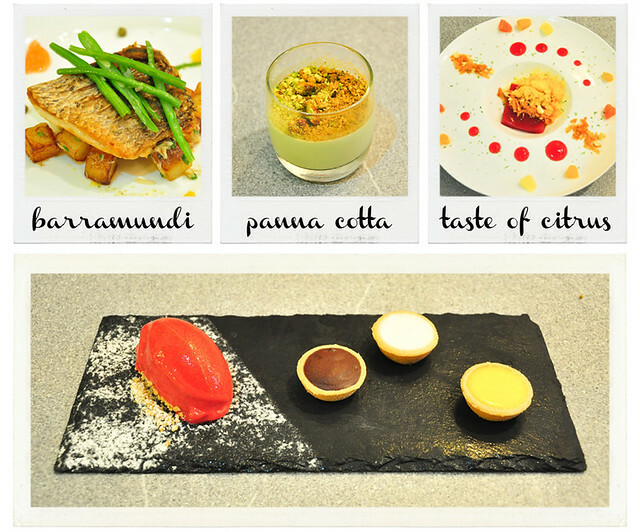 The Taste of Citrus and the Tarts dish was a fail from my point of view. I thought both dishes were just so blah. The main dishes were great but the dessert had much to be desired for. 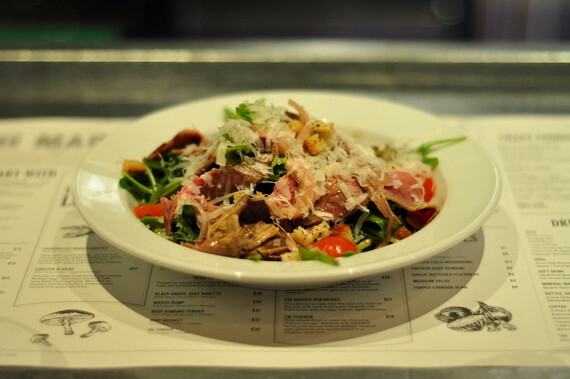 The food prices range from $3.90 – $14.00, so you do get good value for the price. The service was lacking since we had to follow-up on some orders and we found out that we were overcharged with one dessert. We would still come back but I’d check the bill more thoroughly next time. 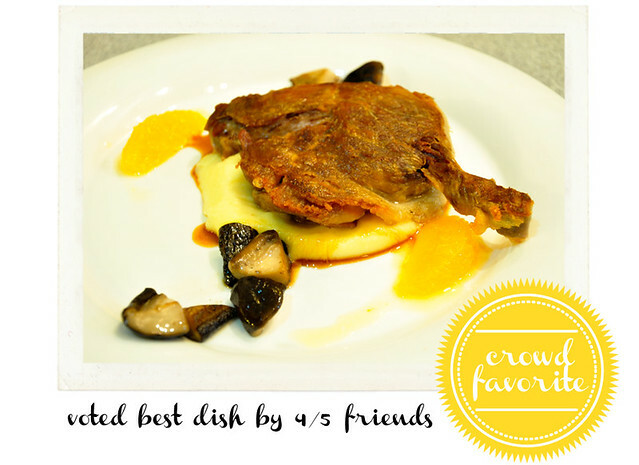 This entry was posted in Food and tagged french restaurant, restaurant, review, Saveur, singapore on November 16, 2012 by Katrina Alana. 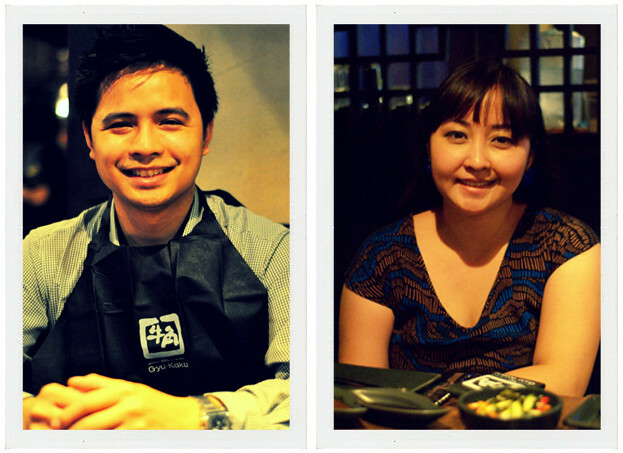 Since my birthday falls on a weekday, we decided to celebrate early with friends so we could hang out longer. Katrina picked Cocotte which she read about in CNN Go and it was also recommend by our friend Marie. The place was a bit difficult to get to by cab since the streets were narrow and there were a lot of one way only roads. It would be better to walk to the place from the main road. The hotel doesn’t really stand out from afar and it seemed like just another building. As we walked closer to the entrance, I noticed that the facade had a nice sign and when we got inside I really liked the interiors. The AC was a bit too cold were we sat since the huge metal tubes were pointed right at us, however the place looked great. It had this laid back vintage industrial look to it. 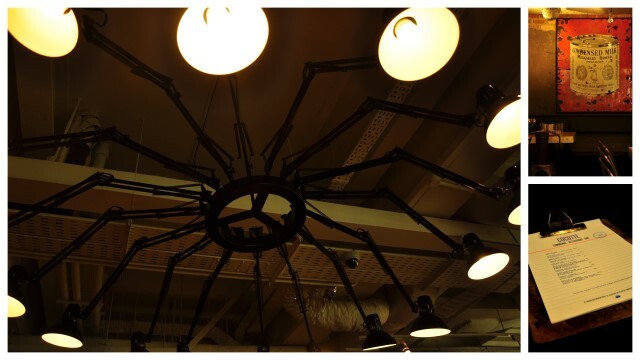 We sat at the largest table where the lighting was arranged to look like a spider. We tried the escargot which was delicious but chewy. We were talking about how it tasted more like mushrooms and it wasn’t slimy as one would think . I had the house specialty which was the pork collar and my wife got the Chilean Sea Bass. 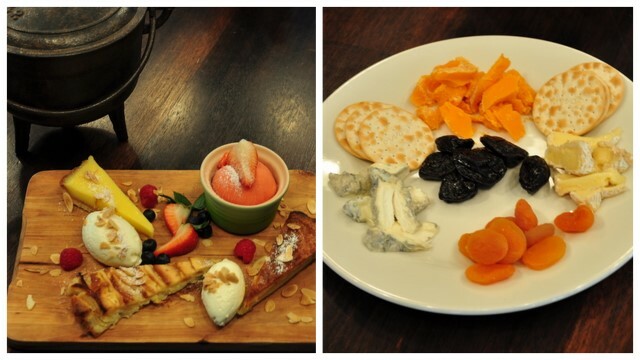 For dessert, we split the chef’s special and a cheese tray. Everyone was very happy with the dishes they ordered and we plan on coming back some time. 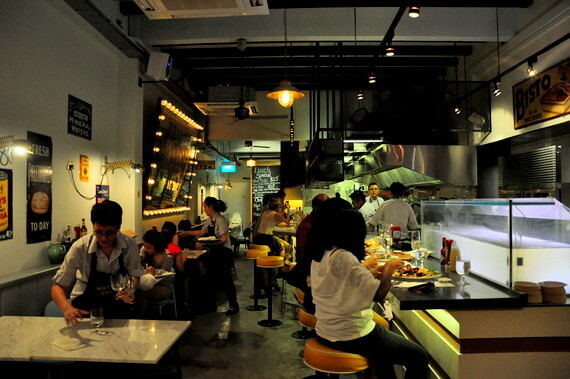 This entry was posted in Food, Interesting Places in Singapore and tagged cocotte, Food, french, restaurant, review, singapore, wanderlust hotel on November 24, 2011 by Katrina Alana.